LOCATION.--Lat 43°07'49", long 77°31'07" referenced to North American Datum of 1983, Monroe County, NY, Hydrologic Unit 04140101, on right bank 525 ft downstream from Penn Central Transportation Co. bridge, near Rochester, and about 1.3 mi upstream from Irondequoit Creek. DRAINAGE AREA.--30.1 mi² of which 2.83 mi² probably is noncontributing. PERIOD OF RECORD.--November 1959 to current year. REVISIONS HISTORY.--WDR NY-74-1: 1972 (M), 1973 (P). WDR NY-76-1: 1960-63, 1964-67 (M), 1968-71 (P), 1972-74. GAGE.--Water-stage recorder and concrete control. Datum of gage is 323.54 ft above NGVD of 1929 and 322.92 ft above NAVD of 1988. 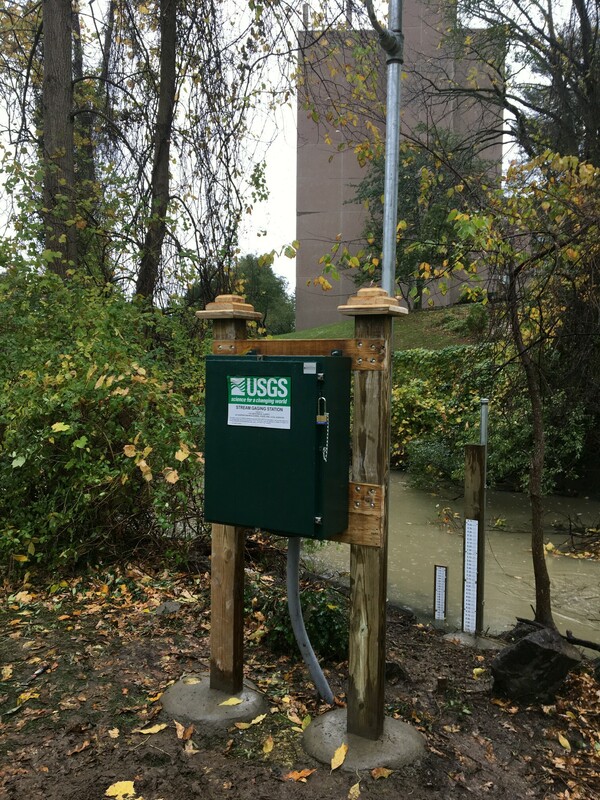 COOPERATION.--Occasional discharge measurements were provided by the Monroe County Department of Environmental Services from 2003 to 2015. Prior to 2003, discharge measurements were provided by the Monroe County Environmental Health Laboratory at Rochester, N.Y. REMARKS.--Unpublished water-quality records for prior years are available in files of Monroe County Department of Health. Discharge includes undetermined diversion (maximum 20 ft³/s) from Erie (Barge) Canal upstream from station. Water Years 2014-15: Records fair except those for estimated daily discharges, which are poor. Water Years 2016-17: Records poor. EXTREMES FOR PERIOD OF RECORD.--Maximum discharge, 3,280 ft³/s, May 17, 1974, gage height, 7.42 ft, from rating curve extended above 1,600 ft³/s on basis of contracted-opening measurement of peak flow and step-backwater analysis; minimum daily discharge, 1.7 ft³/s, Jan. 24, 1963; minimum instantaneous discharge not determined. PERIOD OF DAILY RECORD1.--WATER TEMPERATURES: November 1994 to current year. INSTRUMENTATION1.--Water temperature recorder since November 1994 provides 15-minute-interval readings. EXTREMES FOR PERIOD OF DAILY RECORD1.--WATER TEMPERATURES: Maximum, 26.5°C, July 5, 1999; minimum, -0.3°C, March 6, 2015.